I’ve been a busy bee making blocks for the Simply Solids Bee : I was waaaaay behind but am now all caught up and have even finished and sent my May block before the month begins! I imagine my fellow Fallow hive members will just about fall over from the shock! 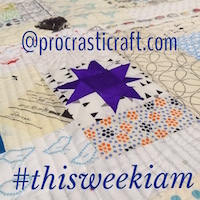 My favourite blocks so far are that one up the top which is a scrap vomit b block using Katy’s tutorial but 2″ not 2.5″ squares and my other fave is the block I made for Adrianne which you can see here. This entry was posted in quilt, quilting and tagged Quilting bee on April 28, 2013 by procrasticraft. 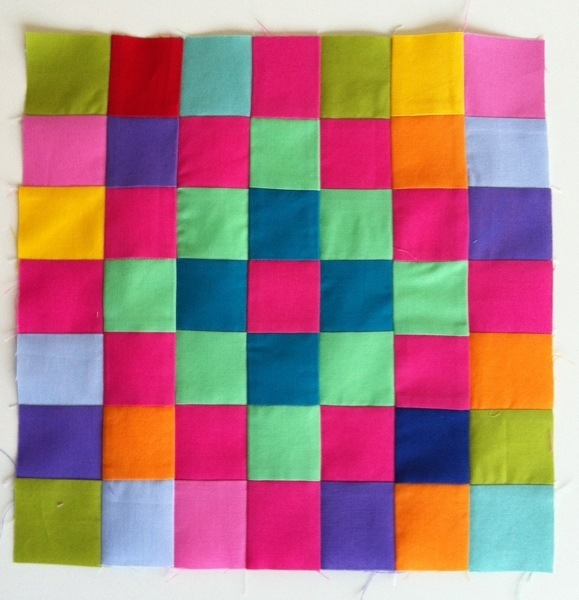 I love your +&x block – the colours are amazing! As for organisation, I couldn’t manage without my calendar – I have it next to the fridge so it’s easy to keep an eye on what’s happening. The only problem is that this year’s calendar starts each week on a Sunday so I keep thinking I’m a day behind. Or a day ahead, it seems to change, which doesn’t make sense! The kitchen is definitely my place for the calendar, not sure about the Sunday start though… that would seem a little strange to me, I like my week’s to start with Monday and end with Sunday, it’s my day for hanging out with no real plans except family time, a reward for the all that has passed the last seven days, definitely not the start of the week! 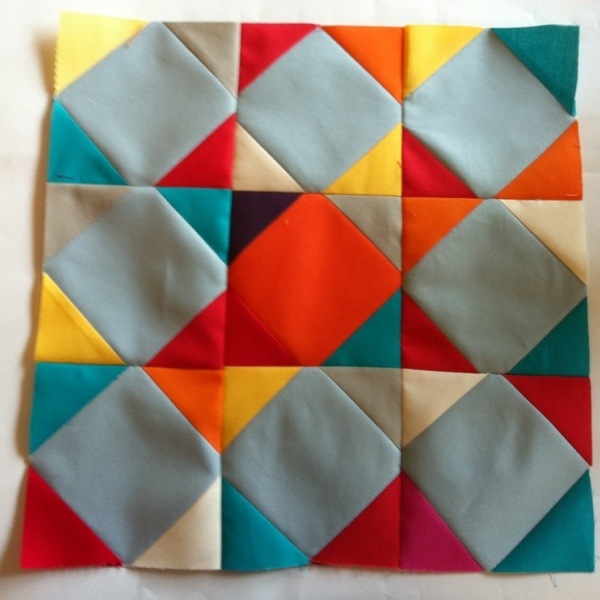 And re the +&x block, what do you think about a whole quilt in solids like this? 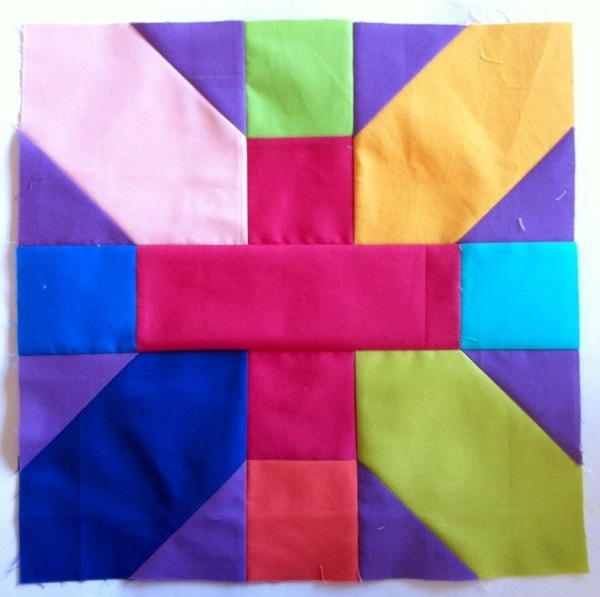 I love this block, thinking of ways to make it in all solids, perhaps keeping all the +’s warm and the x’s cool? Love the bright bold colours in these blocks. Love the reinterpretation of the b blocks for scrap vomit. No tips for running on time from this side of the Capital – I’m hopeless! Helps now that I can just blame the lads! You can most definitely blame the lads. I was never late before small people and really reliable. Now the thing is that I have to manage the movements of 3 smalls, all with very strong wills, well, it’s nigh on impossible to be reliable as its them that dictate. Not that it will last forever though, will be over too soon. Love the bright colours on these blocks! found your blog through your guest post at http://whipup.net and really enjoy to look around. Your quilts are so beautiful! Great minds think alike, don’t they say? I was in three bees, but that was waaaaay too many. My sewing time is too limited to spend that much on other people’s stuff. Now I am in one, which is much more manageable. I think that’s the problem Charlotte, my sewing time is so limited, I end up getting behind in blocks and then not getting any of my own stitching done. So very much wish you were closer, we could have a retreat weekend! What stunning blocks! Amazing how the teal works with the other colours in that third block – love it! Hmmm. Organisation? I dunno I’m pretty hopeless at organising myself but I don’t like being late for anything, and as I have so much memory loss I have a morbid fear of forgetting things so I tend to diarise and schedule everything. I guess it’s just a case of prioritising and self discipline. Bit hard when you have a baby though!! I’m sure you’re doing just fine! Ha! Yes, I’ve been in a few swaps very early on (years ago) where there was a few people disappointed in the end with the standard of some work.